It's ok if you made a typo - it's easy to revise grades! You can revise grades to change them after a student has made some changes on them. There’s a couple ways to access the grade popover in order to revise an assigned grade. You can tap and hold on the grade to bring up the option to Revise the grade on the iPad. While on the web app, you can click on the arrow and then click on Revise. 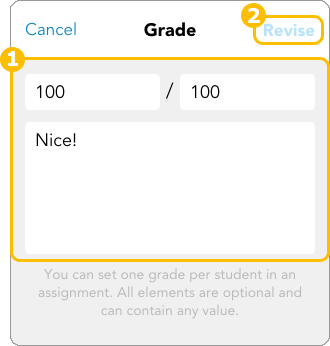 For both platforms, you can also tap on the + icon and then Revise Grade. While in the file viewer, you can also tap on the grade at the top right corner to open up the grade popover to start revising your grade. You can edit each field to change it. You can use emojis to add some fun to grades! Having only the Total field entered won’t let you revise the grade.